The human ability to adapt to changing environments depends on human behavior as well as on the tools we create and use; we are, in fact, symbiotic with the tools we create and in turn they change our mindset and behavior, fostering the creation of new ones to solve upcoming challenges as well as to satisfy our need to explore the new. Embracing the technological evolution to the fullest as designers means embedding toolmaking as a necessary part of the design process, thus making us more adaptable in front of new design challenges, and in the present day the word “tools” in design and architecture implies directly software. No single software fits all the situations and needs of our daily job or research; we must learn to play with many different tools with their own peculiar features, extending and combining them seamlessly in order to expand our toolset and enhance our tools sensibility. The workshop will explore how to use and combine two powerful design tools and exploit their synergies. Blender is one of the most powerful and famous free, open source 3d modeler (and much more – just check the 2013 reel …don’t forget it’s a free software!) 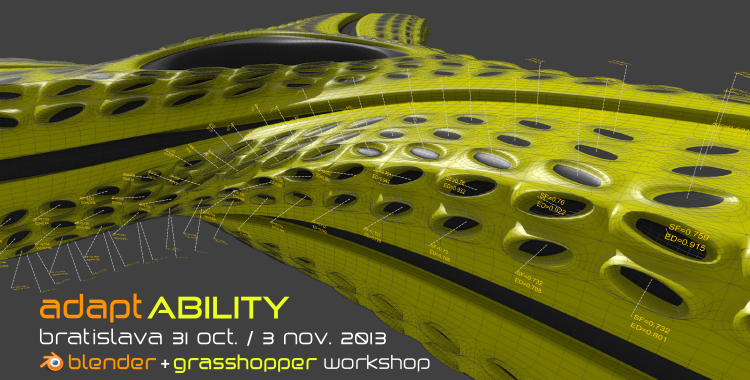 and Grasshopper is the well renowned graphic programming editor and generative modeling tool. The synergistic potential of these tools could lead to new opportunities for custom design strategies and provide new advanced features in our skills set. Basic modeling skills in Rhino and Grasshopper [Primer level] are required. No specific Blender skills are required (although an introductory knowledge of 3D modeling is welcome). Participants should bring their own laptop with pre-installed software. The software package needed has no additional cost for the participant (Rhino can be downloaded as evaluation version, Grasshopper and Blender are free), but since they are subject to frequent updates a download link to the version used in the workshop will be sent to the participants a few days before the workshop. Andrea Graziano + Alessandro Zomparelli – Co-de-iT. * only students, teachers, researchers & PhD (proof of status required) or participants of previous 3D Dreaming or rese arch workshops are eligible for the educational discount. please, send a copy of your valid student/teacher ID or a confirmation from you institute on 3ddreaming@gmail.com.